TimTheScarecrow: My Portal fan art became somebodies tattoo! 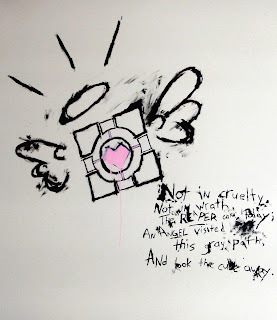 I was looking through images of Portal tattoos when i came across one that looked very similar to the mural i did on my bedroom wall a few years back. This took up the whole wall! Massive! And i guess someone liked it enough to take it to a very talented artist and get it permanently inked into their body! This blows my mind! How crazy cool is that? Anyway, the real credit for the tattoo goes to skimaskmantiac for putting in the work and doing an epic tatt! And i know its been years since this tattoo was even done, but thanks and shouts to the guy who got this crazy cool tattoo! I know its just a basic concept but that really means a lot to me! It looks bawse as hell on your leg, too!